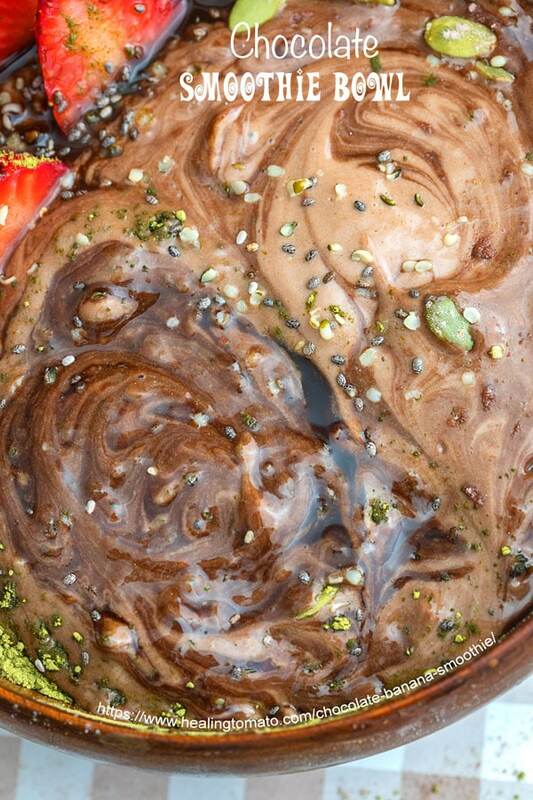 Silky Smooth, Rich, Chocolate Banana Smoothie with Avocado, Peanut Butter, Frozen Banana, Dutch Chocolate, Hemp Seeds and Agave. Its packed with protein and vitamins. Its a decadent breakfast, brunch or just-because snack bowl! I love when I am inspired to make a recipe! I love when the product of that inspiration is this chocolately good! 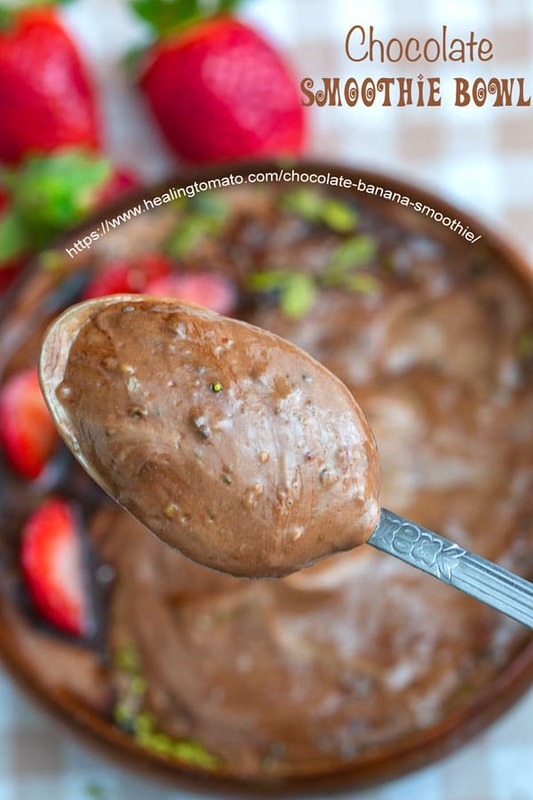 Want More Decadent Smoothie Recipes? It all started Saturday morning when I had this huge craving for chocolate! I couldn’t shake it off, no matter how much I resisted it. But, I ask you, when is just one piece of chocolate ever enough? As I was pulling apart my pantry, the realization that I have almost no chocolate products became painfully clear to me. Those were the sweetest words ever! “This chocolate is going to make the best chocolate smoothie ever” was what I was thinking as opened up the packet and dipped my pinky in it for taste test. And, to toot my own horn, yes, it turned out to be the best chocolate banana smoothie ever. – For garnish, I used chocolate syrup. 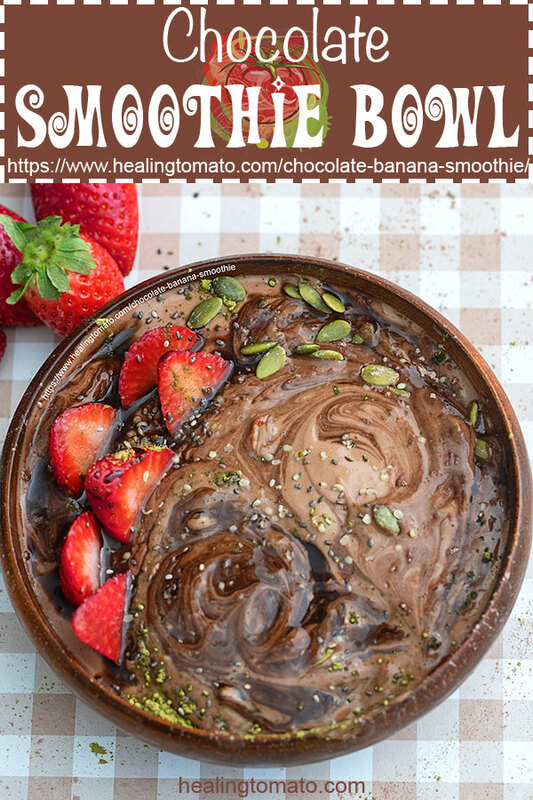 This chocolate smoothie is perfect by itself and needs no toppings! 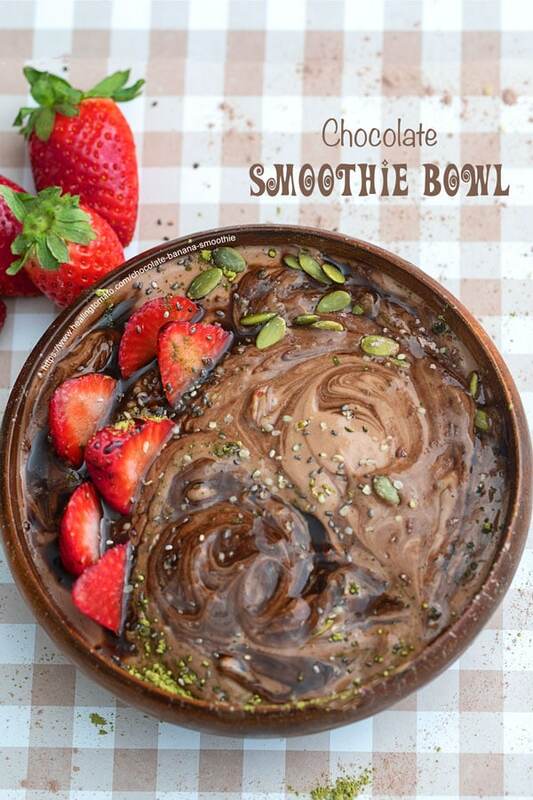 But, in the world of food photography where we eat with our eyes first, a simple bowl with only chocolate smoothie is not drool-worthy no matter how delicious it tastes! 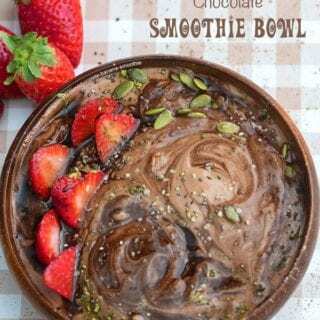 So, I topped this chocolate peanut butter smoothie with other color-contrasting ingredients to really make this smoothie bowl pop and make you want to eat your monitor! Add any ingredient that you like on this smoothie. Come back and tell me what you added to it. 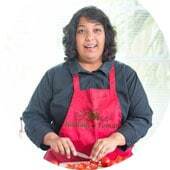 I am always fascinated to see how my readers change up my recipes. Ever since I did a media tour of Florida Strawberries, I have been in love with strawberries! They have a very special place in my heart and I find myself putting it in almost everything. In this smoothie, they are just not sitting pretty. Chocolate and strawberries are a match made in Valentine’s Day heaven! You can always make strawberry dressing out of any leftover strawberries or a Greek yogurt bowl. I added hemp seeds inside the chocolate peanut butter smoothie, but, they are just to pretty to be hidden. Remember how pretty they looked in my Amaranth Tabouli Recipe? I used regular chocolate syrup in this recipe. 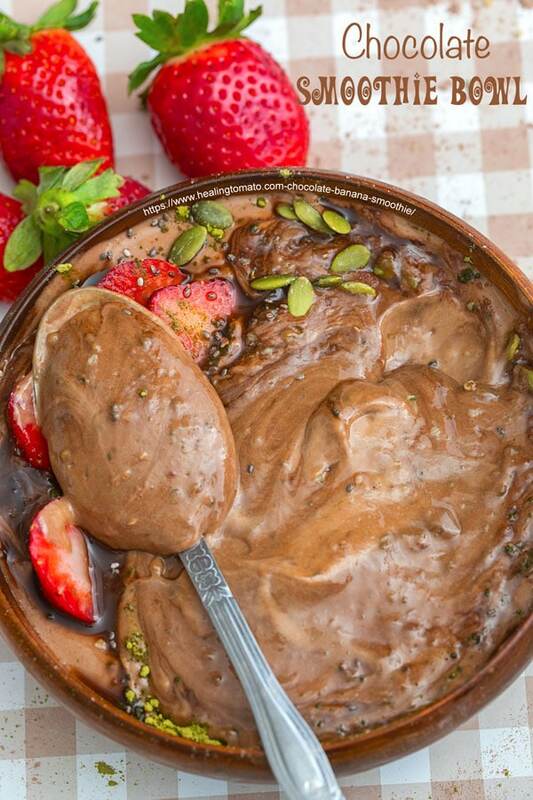 If I had time, I would have made a vegan chocolate syrup to drizzle on top of the bowl and strawberries. Its easy to make and delicious. P/S You can use the frozen bananas you can put them in a waffle recipe. If you don’t want to freeze them, use them up immediately by making this spicy banana salsa recipe. This chocolate peanut butter smoothie not enough for you? As it so happens, some of my fellow food bloggers have made delicious smoothie bowls that you cannot resist. Which one is your favorite from this list? You will be happy to know that I ate the whole bowl of my chocolate banana smoothie bowl and it completely satisfied my chocolate craving! So, its your turn now. Tell me what satisfies your chocolate cravings? Garnish with your favorite ingredients and devour! Sounds like the perfect treat for after my workout!!! 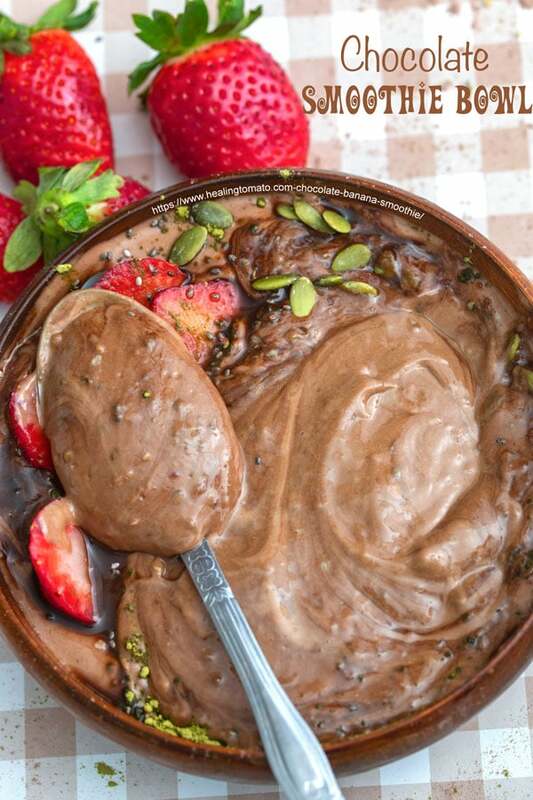 This is probably one of the prettiest chocolate smoothie bowl I’ve seen! Yes, eating with my eyes for sure. I actually keep a stash of avocado halves in my freezer, so I’m set to whip this up! This looks simply divine! all that creamy chocolate! Swoon! I’ll be making soon! That looks so delicious! Almost like dessert! Thank you, Stephanie. Its perfect for anytime of the day, especially dessert. I’m just drooling. 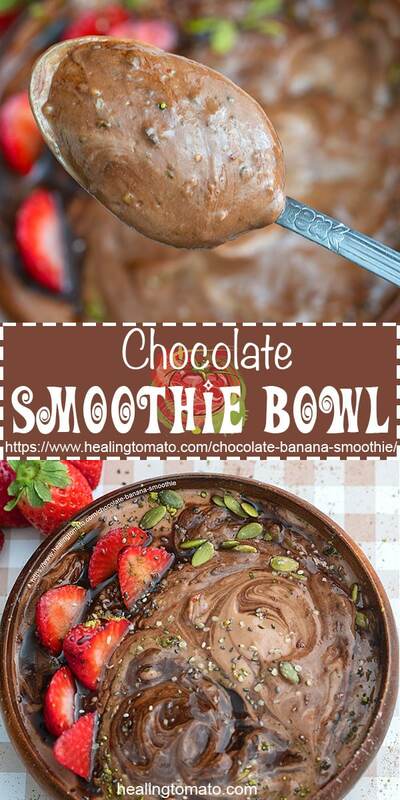 I am a huge chocoholic and this smoothie would definitely take care of my cravings!